Lee's Chop Suey on Diversey & Western will make your appetite disappear. Went there for the first time about 2 years ago. Someone in this thread mentioned that a restaurant should be given more than one shot to truly judge it, a belief I partially share. I've given Lee's two shots, only because the first time was so jaw-droppingly, I-must-be-on-Candid-Camera, wouldn't feed this to my worst enemy wrong that I had to go back a second time to be sure it wasn't a prank. Both times, the "food" I ordered (and I went with other people both times as well) was absolutely devoid of taste. This is not a joke. I'm not talking bland or not enough salt or not spicy enough, but NO TASTE. The shrimp egg foo yung looked decent eough on the plate, but was mushy, limp, and tasted like - nothing. Remember the Neverending Story? The big creature warning about the "nothing?" "You mean, is it a hole?" "Well, a hole would be something. This is .... nothing." It was as though a flavor vampire had sucked the life out of this plate of food. Really, it tasted like it had been intentionally boiled and blanched for hours just to make sure no taste molecules somehow sneaked in. My friend's chop suey (the "signature" dish . . . haha) suffered a similar fate - limp, beyond bland food in a place whose idea of chop suey is wallpaper paste with greyish hunks of meat and a lot of celery and peanuts. The second time at Lee's, I got more adventurous and tried garlic chicken. True to form, the chicken was like biting into a piece of foam rubber, and there must have been a garlic embargo that day, cause there was none to be found. It's too bad about Lee's - an old-school American/Chinese looking place (all reds and vinyl booths and hanging lanterns) so close to my house, with nice owners and waiters too. Unfortunately, I could think about food and get more taste on my palate than from what is actually served there. As Mad Magazine would say, "Yeccchhhh." In truth, I find the rest of the food edible, but 90% of the time, I only order the egg rolls. Last edited by Ramon on October 3rd, 2007, 4:32 pm, edited 1 time in total. Lee's is just west of Western. I used to live 3 blocks away from there and made the mistake of eating there just once. Never again! Everything there was mind-numbingly bland. Boy, don't ask me for directions! Will edit OP. Lee's egg rolls are stellar in my pantheon, despite the extreme blandness of the rest of their food. Having had an office blocks from there for years, I can attest that edible food can be ordered. It's better than most places in my neighborhood (Lawrence & Harlem, I think) and I've been here almost twenty years, searching. My 19 yo is currently suffering the aftereffects of eating in one of our local Chinese places yesterday, and missed an important test at school as a result. She would have done better at Lee's. Being our first time, we ordered a bunch of things, all of which disappointed on one level or more. Dishes were either too sweet or entirely bland. Sauces were either gloppy or too thin. 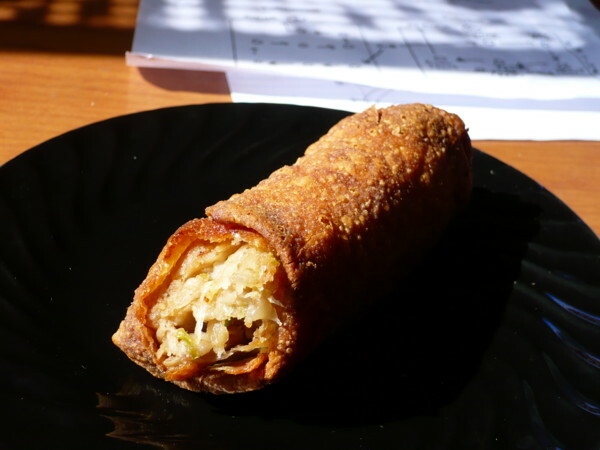 Egg roll was nothing more than an ok-but-nondescript vehicle for dipping. There was just no satisfaction on any level. Who could eat here and like it? I'm baffled. LOL, I am somewhat baffled by this thread. I don't disagree with the majority assessment, but I reckoned after my visit to Lee's that it was an average to good Amer-Chinese take out joint, with extra credit awarded for being open slightly later than average. Now, I can't claim to remember anything I ordered, owing I'm sure to the widely acknowledged flaw of the food, but isn't that the point of neighborhood Chinese? Low prices, abundant portions, too much grease? Lee's Chop Suey, count me a half hearted fan when it's the only place open! Bok Choy Jr wrote: LOL, I am somewhat baffled by this thread. I don't disagree with the majority assessment, but I reckoned after my visit to Lee's that it was an average to good Amer-Chinese take out joint, with extra credit awarded for being open slightly later than average. Now, I can't claim to remember anything I ordered, owing I'm sure to the widely acknowledged flaw of the food, but isn't that the point of neighborhood Chinese? Low prices, abundant portions, too much grease? Lee's Chop Suey, count me a half hearted fan when it's the only place open! Haha, that is a ringing endorsement! My theory is that from a quality perspective, most of these types of places fall within the same narrow range, and that people tend to prefer what they grew up with -- or places where the food is most like what they grew up with. So one's favorites aren't necessarily better or worse, just less or more similar to what they are accustomed to. Low prices, abundant portions - that's the ticket. My wife works with people who occasionally make a trip to See Through Chinese Kitchen to pick up lunch. They pretty much say "it isn't very good but I get enough to have lunch for an entire week." OK, so I guess having bad food for an entire week is an attraction for some people.